No visit to Beijing is complete without spending some time in Tiananmen Square. It is the symbolic center of China with a sordid past. Tiananmen Square is the world’s largest public square, though quite sterile in itself. Tiananmen Square is flanked by Zhengyang Gate to the south, the Forbidden City and Gate of Heavenly Peace to the north, and grand 1950s buildings, including the National Museum of China, to the east and west. The Monument to the People’s Heroes is at the very center of the square, and the Chairman Mao Zedong Memorial Hall is to the south of the monument. Zhengyang Gate at the south end of Tiananmen Square. Monument to the People's Heroes and the National Museum of China. Tiananmen Square offers a great view of the Forbidden City and the Gate of Heavenly Peace. While Tiananmen Square is a public square, it is very much controlled by the government, and its symbolism still makes it a potential target for demonstrations, which means it is heavily guarded. Just a few weeks before we traveled to China, five people were killed and many were injured by a car that was purposefully crashed on the sidewalk just outside Tiananmen Square at the entrance to the Forbidden City. A police and military presence is constantly felt in Tiananmen Square. But they are good natured to allow photographs and civilian marchers. Tiananmen Square is completely surrounded by barriers and one must pass through security, which includes a bag scan and possibly a quick frisk, before entering the square. Security is not actually interested in non-Chinese tourists. They are more interested in the Chinese that look old, dirty, or poor. These are who they think might cause a problem; dispirited citizens looking for justice. While we entered a few times without even a look, one time with me not even having to put my bag through the x-ray machine, I witnessed many Chinese people being frisked, especially those who were older. bags and cameras before joining the long security lines to enter Tiananmen Square. While a visit to Tiananmen Square does not require much time, it does contain a tourist attraction which I think may be overlooked by many non-Chinese travelers, but was one of the most fascinating sites to me, the Chairman Mao Zedong Memorial Hall. Chairman Mao is laid to rest in the Hall of Mourning, where the public can view him and pay their respects. Do not expect to dawdle during your visit. There is a steady stream of visitors entering and exiting the Hall and the guards make sure everyone maintains a certain speed while passing through. Before entering the Chairman Mao Memorial Hall queue, you must first have any purses, bags, and cameras stored in a locker across Guangchang East Side Road just to the east of Tiananmen Square. There are signs for the bag check building, and once inside choose a window and get in line to check your items for a small fee. Return by the given time to the same window to retrieve your belongings. Keep your wallet with you, and you can also keep your phone. There are no pictures allowed in the Memorial Hall. After checking your belongings, cross the street, go through security to enter Tiananmen Square, and join the line to enter the Memorial Hall. The line starts at the north-east of the building, and you will enter at the north entrance and exit at the south exit. Admission is free. A passport is supposed to be shown, but our passports were never requested. While you are required to carry your passport with you at all times, we were advised by many to leave our passports in our safe at the hotel and carry a copy in case of pickpocketing. When we did have to show a passport, our copies were enough. The line moves quickly through the first floor of the Memorial. The entryway has a large marble statue of Chairman Mao with a tapestry of China’s mountains and rivers behind. Many Chinese quickly approach the statue to leave flowers that they have picked up from vendors within the secured area while in line outside. The orderly procession next moves into the Hall of Mourning, where Chairman Mao is interred in a crystal casket wearing his gray suit and draped in the Communist Party flag. His casket is in a glass room, and there are two guards in the room with him at all times. This is supposed to be Chairman Mao’s actual embalmed body, though his face appears to be shiny wax. After viewing Chairman Mao’s body, the group exits the building, where there are stands selling Chairman Mao trinkets outside. A steady stream of people exit the Chairman Mao Zedong Memorial Hall. 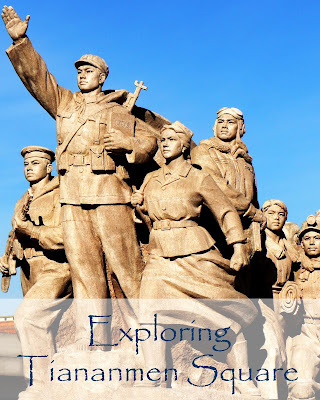 The entire experience of visiting the Chairman Mao Memorial Hall takes only thirty minutes to an hour from start to end, including bag check time, but is quite a surreal experience, especially for a non-Chinese visitor. Tiananmen Square also presents visitors with the overall feeling of China; large, impressive, guarded, no frills. Visit the Chairman Mao Zedong Memorial Hall in the morning, as it is only open until noon. Tiananmen Square and Chairman Mao Zedong Memorial Hall are easily accessed from Qianmen metro station, exit A.